Following more than a week of protests over delayed and inadequate relief response in eastern China’s typhoon-ravaged Zhejiang Province, officials took to the web to plead for calm, self-restraint, and understanding. As thousands of protesting residents, organized through China’s social media Weibo, gathered in the city of Yuyao, the head of the province’s Communist Party (CCP) Organization Department appealed to residents on his own Weibo account on Tuesday to restrain themselves, reported state media. He said that local government officials have been trying their best to provide relief services following the disastrous flooding. Protesters were blocked from entering the city office buildings by hundreds of Special Forces and police in riot gear. The police arrested several people for throwing bricks, water bottles and trash and tipping over government vehicles. Residents who were interviewed estimated the crowd size at about 10,000, and said that some protesters were badly beaten by the police, reported Radio Free Asia (RFA). Angry flood victims demanded the resignation of officials responsible for the lack of rescue operations or relief supplies in the wake of Typhoon Fitow. “They were calling on municipal CCP secretary Mao Hongfang to come out and apologize,” a protester told RFA. Protesters, angered at broadcasts that they believed exaggerated the rescue progress in the flooded areas, also demanded an apology from the Ningbo television station, a local resident told the state media. The frustrated residents said that electrical power still had not been restored to some areas in the city. The Feichangdao website, a Weibo watchdog, posted screenshots showing that at some time on Tuesday evening or Wednesday morning , social media Baidu and Weibo began censoring searches for “Yu Yao Demonstrations”. A resident told RFA that some people had taken photos of the police beating protesters and texted them to friends, but said “I daren’t pass these around now,” referring to close monitoring of cell phones users’ accounts and social media posts by the CCP censors. 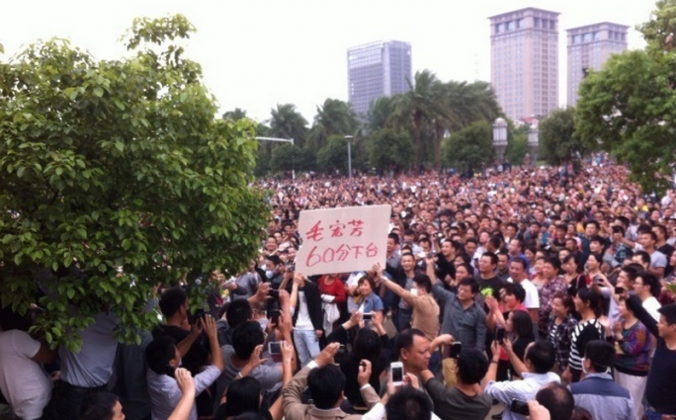 Last Wednesday thousands of Yuyao City residents blocked a highway in a similar demonstration. “A lot of people couldn’t get through when they tried to call for rescue … We couldn’t get through to the government, and they didn’t send us any supplies,” she said. A newsman caught in the act of lying about flood damage I eastern China’s Zhejiang province, was attacked by irate locals.